What Does a 4Citizen Look Like? Flash back to one year ago today. There I am at my desk in Calgary, Canada, writing away like I do most days. That despondent look on my face, that’s the look of someone who needs a change. A new challenge. Maybe this image looks familiar to you. It could be a mirror image of yourself. Even if it isn’t, I’m hoping these words strike a chord with you. Illustration by Maitri Dore, Cohort 09. The reason I’m revisiting this time last year is that it’s around the time that I applied to 4CITIES. Uninspired by my career in corporate marketing, I wanted to pursue a new field, but I wasn’t sure where to start. As a life-long urbanite, I had a general curiosity for how cities and people interact: I followed local planning projects, I bookmarked citylab.com in my web browser, and I went to conferences devoted to municipal policy issues. So why not study the city? One year later, I’m officially a 4Citizen – and if you’re wondering what that means, it’s our label for all current and former students of the 4CITIES programme. But what does it REALLY mean to be a 4Citizen? Now that I’ve completed my first semester, and I make the move from Brussels to Vienna, I’ve had some time to reflect on this question. Hopefully my insights will be helpful to those of you who are considering the programme, much like I was one year ago. With that, here are the characteristics that, I believe, define 4Citizens. Day 1 of the programme, I sat down in our urban geography lecture and the first question out of the professor’s mouth was ‘What is the city?’ Then the room sat silent for a good 20 seconds. A class of 35 students pursuing a Master’s in Urban Studies collectively came to the realisation that, despite our extensive and varied backgrounds, none of us could answer this behemoth of a question. For good reason: there is no right answer. The city can be interpreted, analysed and critiqued in any number of ways. That piercing question was a real eye-opener for me: it unveiled how narrow my perspective of the city was. Until then I saw the city in terms of major infrastructure projects or development plans, with little regard for how these functions relate to physical and social conditions. 4Citizens recognise and embrace the complexity of the urban environment, and we devote ourselves to understanding this elaborate network. Building a deep understanding of the city starts in the classroom with critical theory. We’re taught to critique the way cities are designed and managed, looking past so-called “best practices” or the allure of flashy architecture. We challenge the merits of policies and projects, questioning who they serve and why. Of course, theory can only take you so far, which is why 4CITIES excursions are so valuable. When I was considering the programme, the promise of trips to dozens of European cities – and getting to live in four of them – was a huge selling point. What I didn’t realise at the time was that these excursions would take me to places no tourist would ever go. 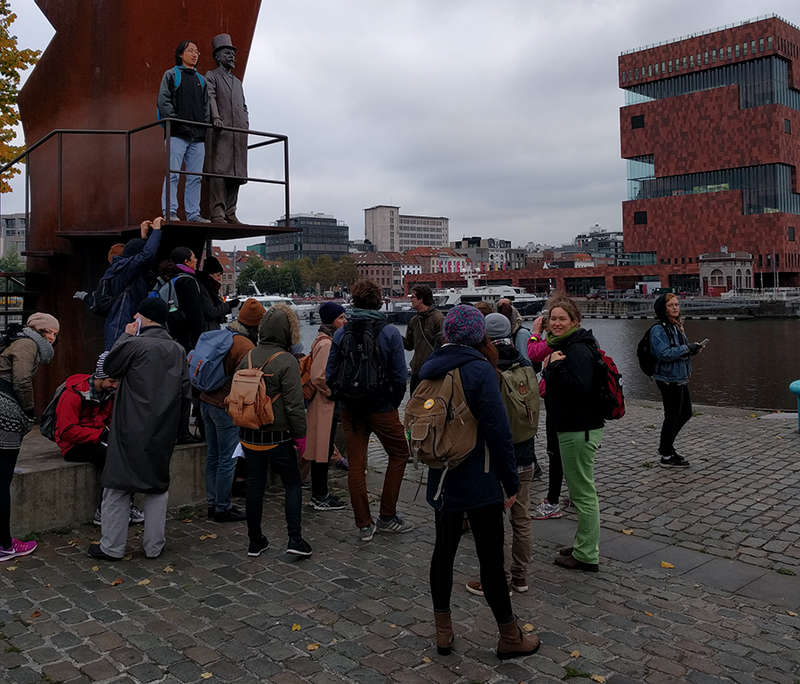 I’ve learned that uncovering the causes of segregation in Antwerp demands a visit to the city’s suburban enclaves and social housing blocks, not just its majestic ‘Grand Place’. Few people, I suspect, have even heard of Charleroi or Mons, yet these cities have taught me as much about the reaches of neoliberalism as any major metropolis. New city, new local language, new faces, new course material. Now times that by four within a two-year window. Yes, 4Citizens live unsettled lifestyles filled with personal and academic challenges. It’s unnerving approaching complete strangers and asking them in broken French to draw you a map of their neighbourhood for an assignment. It’s annoying not being able to find your favourite foods from back home in the supermarket. It’s also frustrating having to pack up your belongings and move right as you start to feel familiar with your surroundings. Welcome to 4CITIES. 4Citizens don’t have comfort zones. Instead, we embrace and adapt to every new situation that the programme throws at us. It takes a ton of patience, energy and determination, but nobody confronts the challenge alone. Ultimately, 4Citizens form one big nomadic family. We move from class to class and city to city, tackling whatever gets thrown at us. The collective brain power in the group is impressive and is founded on our diverse backgrounds. 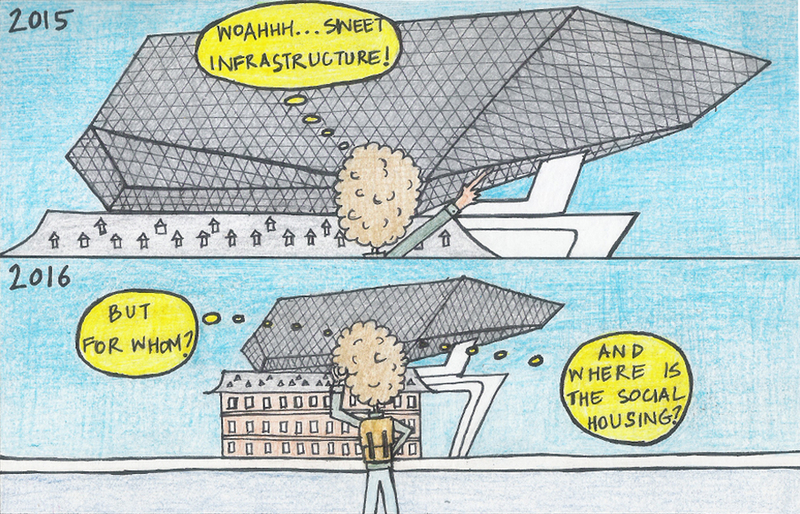 Some 4Citizens are urban planners by trade; others are architects or journalists. We share and feed off one another’s skill sets both in the classroom and in social settings. The sense of solidarity amongst 4Citizens is most obvious during hard times – believe me, “hard” doesn’t even come close to describing the wave of work that hit us at the end of the Brussels semester. But study groups were formed, notes were shared, and selflessness prevailed. On a personal note, when I think of the 4Citizen family, I think back to my birthday in October. 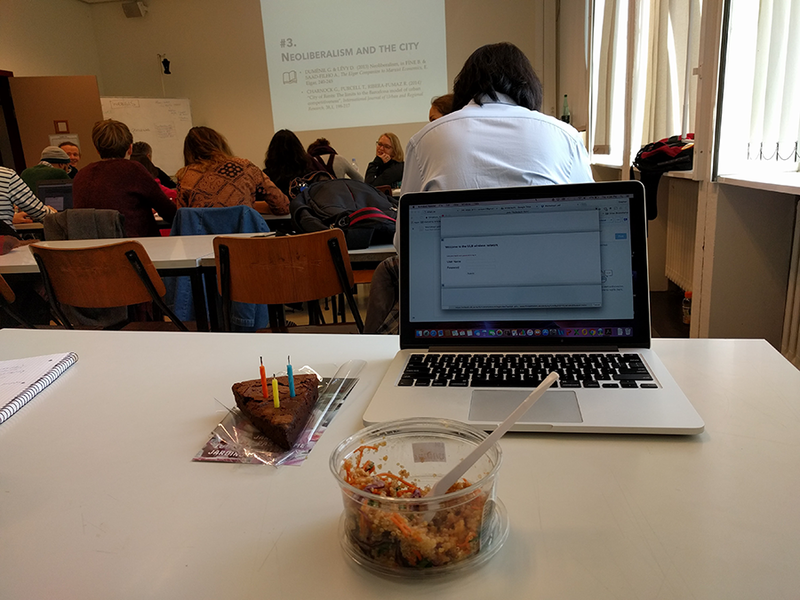 Six hours of lectures, one of which ran from 5 until 8 p.m. Maybe not the ideal way to celebrate the big 3-0, but my classmates still made it feel special (see for yourself). That’s what family members do for one another. These are just a few of the qualities required of 4Citizens that I’ve recognized through my classmates over the past five months. As we transition towards the second semester in Vienna, our critical mindsets, adaptability and unity will continue to be put to the test as we face a whole new set of personal and academic demands. I realise now that the discomfort that comes from these variable circumstances is what makes 4CITIES such an enriching experience. One year ago, I was stalled in my life back home. Now, as a 4Citizen, each day, each hurdle is an opportunity to grow. I am not only fulfilling my curiosity for the city and gaining skills conducive to a career change; I’m becoming more in-tune with myself as new experiences illuminate my strengths and weaknesses, allowing me to target areas for improvement. Of course, it helps to have 34 other adventurous souls supporting me on this journey of personal development.